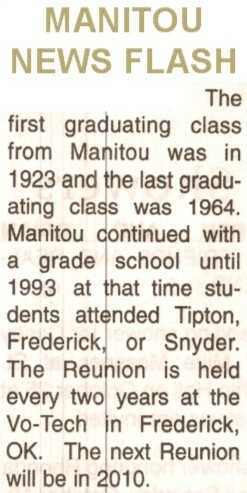 Manitou School, Oct 1st and 2nd 2010 Reunion! would like to thank each and every one of you who participated in the 2010 school reunion by your attendance at the banquet or at the visitation times. I would especially like to thank each and every one of you who volunteered your time and talents to make this year's reunion a success. We couldn't have a reunion without your "gifts of love." I know that some of you travelled a long distance, and at some expense, to join us at the reunion. Your presence was greatly appreciated and we hope this will not be your last visit to our reunion. I would be remiss if I didn't also mention the Altus Air Force Base Honor Guard team that performed a flag ceremony for our banquet attendees this year and with their special recognition of four of our alumni who honorably served our nation during World War II...Ernest Hoover, J.M. Cope, Doyle Givens, and D.A. Bloodworth. I know that I had a great time being able to see friends and acquaintances from the past and to be able to reminiscence about days gone past. I look forward to seeing each of you once again in 2012. Special guest appearance by Elvis impersonator, Vincent Orr, owner of Orr Gray Gish Funeral Home. It seemed like all the ladies especially enjoyed Vincent's special talent. Thank you Vincent for entertaining us. Special plaque presentation to former alumni president, Louis Box, for his many years of dedicated service to Manitou classmates alumni, by our new president, James Zellmer. Von Lee "Bud" Mulkey and wife, Leta (Class of 1950).